AV Micah Melbie, Morris, PA, USA, built a Richter (Hurlbut) design from sets 206 and GK 8. The special book, 206A, was produced to encourage builders to continue building with the Modern House (American Bungalow) sets; it was a midway step (206 + 6 + 6A) between 206 + 6 and 206 + 208 + 6 + 6A. Many people who bought set 206 already owned sets 6 + 6A. My father received set 206 for his 9th birthday, August 11, 1913. More pictures are found on the builder's page. A link to the USA wholesale agent for The New Stone Era (Die neue Steinzeit) has been added to the list of links at the bottom of this page. And, of course, The New Stone Era (Die Neue Steinzeit) sets are now available in the USA, including here on-line. New sets are being introduced rapidly. These sets are intended for young children, not the older children and adults who enjoy the traditional Anker sets. But the New Stone Era sets are very important, because they introduce Anker to the new generation. And the Starter Set provides a transition to the traditional Anker sets. They are a perfect gift to children and grandchildren -- introducing them to the enjoyable hobby of building with Anker sets. If my granddaughter is typical, a perfect first gift is the small dinosaur (DINOSA) set. Young children are fascinated by dinosaurs! Jerry Slocum has written The Anchor Puzzle Book. It is a very important book on Anker -- not just the puzzles, but also F. Ad. Richter & Cie. 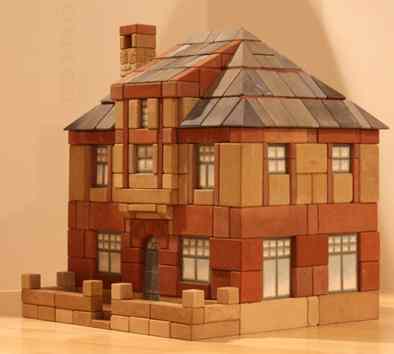 The carefully researched history of the Anker puzzles also adds to our knowledge of Anker Stone Building Sets. Buy the book; you will not be disappointed. Reserve a book for delivery at the CVA meeting in Hilversum on April 6th, the meeting in Traiskirchen, Austria, on April 13th or the Anker Treffen in Rudolstadt on September 14th. The CVA Anker Internet Archive is now on-line. In addition to the scans and other Anker information, this archive provides links to most other Anker sites on the Internet. It is getting better every week and is still being worked on. The intent is to put all digital Anker information on this site. The last CVA meeting was held on Saturday, October 20, 2012; Hotel Lapershoek in Hilversum, Netherlands. The next CVA meeting: Saturday, April 6, 2013. On Saturday April 13th, the Austria Anker/Matador friends will hold a meeting at the Stadtmuseum Traiskirchen. Ad van Selms and I have made travel plans to attend. An Anker Treffen was held in Rudolstadt onSaturday, September 22, 2012, at the Anker factory in Rudolstadt, Germany. The next Anker Treffen will be held on Saturday, September 14, 2013, at the Anker factory in Rudolstadt, Germany. I have no information (yet) about a get-together at Hodes, Mörla, on Friday, September 13th, but I am sure there will be one. A new and important Anchor web site: János Végh <vjbp3400@yahoo.com> of Hungary has created a web site which could well become the main Anchor Stone Building Set web site. The plan is to make everything available as well as provide links to all other Anchor web sites. I urge everyone to take a look. Now! And you can download my book as a PDF file -- English version or German version. I am in the process of converting the book from AmiPro to Word and, since I have the pages open, updating and revising it. Many of the new designs for currently manufactured sets can be downloaded from of Andrea Mazzocco, Switzerland. Here is a list of most (never all when discussing the Internet) Anker sites: ankerstein.ch/archiv: The majority of Anker information. The best place to look. ankerstein.ch/forum: An open forum on which AVs can post information, questions and answers. ankerstein.ch/org/index.htm: The archive of all editions of ankerstein.org – on line since 1993. ankerstein.ch/html/patente_.html: A list of Anker/Richter German and American patents. ankerstein.ch: Other links to Anker information. clubvanankervrienden.nl/: The CVA’s official web site. ankerstein.org: A monthly Anker “e-zine”, since 1993. Also an “official” CVA web site. ankerstein.de: The Anker factory’s web site. ankerstein.cl: Anker information in Spanish. ankerbaratai.hu: Anker information in Hungarian. nikhef.nl/~i56/Anker.html: Fred Hartjes’ web site with Anker information, including the history of Baukunst im Kleinen (BiK). ankerwiki.de: Andreas Abel’s web site. Presents most of the GK-NF plans redrawn using AnkerPlan. ankerstein.ch/downloads/index.htm: Building plans be AVs, including the building plans from the CVA sponsored Baukunst im Kleinen (BiK). ankerstein.ch/downloads/CVA/Book-PC.pdf: George Hardy’s book on Anker Stone Building Sets. ankerstein.ch/downloads/CVA/Buch-PC.pdf: German translation of George hardy’s book. The Richter villa is closed. The Spielhausverein has moved, and the villa is now owned by the heirs of Eversbusch. All of the Anchor archive materials being housed there and the collection of Anchor sets have been moved to Heidecksburg. The large collection of old Anchor stones, many of which are quite rare, was left in the possession of the Spielhausverein. It is my understanding that these stones have been sold. For those of you who are interested, here is a picture of me, my granddaughters, and my cats. Yes, I have a granddaughter and "new" cats. My picture is relatively new, taken in October, 2008, on a trip to Antwerpen. There is also a new cat picture. BTW, after reading The Facebook Effect, I signed up. The last CVA meeting was on Saturday, October 20, 2012. The next meeting date will be on Saturday, April 6, 2013. See the CVA page for details. In addition, every year, the new Anchor factory in Rudolstadt, Germany holds three or four "Treffen", or "open door days", at that factory. The Treffen in September attracts many Anchor friends. In 2011, this Treffen attracted many attendees, including me. The Club of Anchor Friends (CVA) has published a Stone Catalog. The new printing has been done, and the catalogs have been sent to CVA members. There is already a list of pages being revised. Not major omissions, but changes worth making. The amount of additional work to do continues to grow; the discovery of the original molds has added even more work. I saw one mold which was used to make a stone I had never seen -- not even heard of. That mold was one of a pair -- a corner stone and a rectangular stone. The new factory has made a few samples of each. Of course there was no way to know the correct thickness. Close examination has shown that these stones are a new design for the roof stones of the DS (Dachstein -- roof stone) sets and allowed me to determine the intended thickness. Richter's Anchor Stone Building Sets (Richters Anker Steinbaukasten) were the world's most popular construction toy from the early 1880s through W.W.I. These building stones were made in Rudolstadt, Thuringia, Germany, (and at the company's branches in Vienna, New York , but not St. Petersburg, Russia). Starting in 1880, Richter's Anchor building stones were covered by international patents and trademarks. AV Burkhard Schulz, Ellerau (bei Hamburg), Germany, produced a wonderful video entitled Ankerstadt Rudolstadt. He gave a copy to the CVA Archive, and it is possible he might let you have a copy if you want one. Americans remember: 1) the video is in German and 2) the German TV system is not compatible with the USA TV system. For the month of June, 2013.